We’d love your help. Let us know what’s wrong with this preview of All the Little Fathers by Margaret Wise Brown. Published May 8th 2015 by Parragon Inc.
To ask other readers questions about All the Little Fathers, please sign up. Just in time for Father's Day! This is an adorable addition for a toddler's library, especially for those that treasure Margaret Wise Brown! The illustrations pair fantastically with the simple prose. Each page features a different animal father engaged in activities with their little ones, culminating in putting their children to bed. This is perfect short bedtime book for the littlest of ones. This is really nothing more than a short tale about fathers and their young'uns to be read as a bedtime story . . . preferably by dad. The artwork by Marilyn Faucher, however, is simply stunning. Each page is a visual treat, and manages to make up for a lack of real story. A sweet little book showing all the animal fathers doing specific things with their children, whether jumping or roaring or swinging, and then all putting them to bed. I think my toddler will love the detailed illustrations, and I love the concept of engaged fatherhood. Disclaimer: I received a free copy from NetGalley in exchange for an honest review. Great artwork, but really lacks any substance. It's mostly a bedtime story book that is supposed to be read by fathers to their kids, and this is a really weak selling point. Like I said great art cannot save or make a great children's book alone. We received this book from NetGalley to give an honest review. I read this to K last night and he seemed to be okay with it, the only question he asked was why are the animals calling their children, children? He said they are not children they have names for what they are. Which he is right, example in the story we have a father rabbit hopping with his children which should be called kits or kitten, bears should be called cubs and so forth. The story is very short and to the point I would recomm We received this book from NetGalley to give an honest review. I read this to K last night and he seemed to be okay with it, the only question he asked was why are the animals calling their children, children? He said they are not children they have names for what they are. Which he is right, example in the story we have a father rabbit hopping with his children which should be called kits or kitten, bears should be called cubs and so forth. The story is very short and to the point I would recommend this story to the younger kids I plan on reading this story to A tonight and she is two. I think she would enjoy it more than her brother did. The pictures go well with the theme and you get to see different animal fathers hanging with their "children" and doing different things with them. A very simple & cute bedtime story for very young children. Why do some animals talk, but it has a lot of words? Lot, lot, lot of words. Everyone is familiar with Margaret Wise Brown’s iconic works Good Night Moon and The Runaway Bunny, but she wrote so much more than just those two books. Many of her books were discovered after Brown’s untimely death at age 42 in 1952 - it boggles the imagination to think about what she could have accomplished had she lived longer. Now, many of her books are being published in new editions for yet another generation of young readers already falling asleep to the soothing text in Good NIght Moon. Everyone is familiar with Margaret Wise Brown’s iconic works Good Night Moon and The Runaway Bunny, but she wrote so much more than just those two books. Many of her books were discovered after Brown’s untimely death at age 42 in 1952 - it boggles the imagination to think about what she could have accomplished had she lived longer. Now, many of her books are being published in new editions for yet another generation of young readers already falling asleep to the soothing text in Good NIght Moon. This year, Parragon has published All the Little Fathers for the first time. Generally, when we think of babies, we picture their mothers caring for them, but sometimes, just like human kids, baby animals like to be with their dads, too. In page after page, young readers are introduced to baby animals and the things that they do with their fathers. The ending is rather nice, with all the fathers putting their babies to bed after a busy day. Richly illustrated watercolor illustrations by Marilyn Faucher lend much to each of the pages. Margaret Wise Brown really knew how to write a great read aloud story and All the Little Fathers is not exception, having a nice soothing rhythm to it. This is a nice book for fathers and their children to read together, especially at bedtime. What a perfect bedtime story for a father to read to his preschooler. Even moms can join in the fun. The color illustrations by Marilyn Faucher are whimsical, capturing the joy of each animal dad frolicking with his child out in the wilderness. Add the visual with the rhythmic cadence of Margaret Wise Brown's writing style, perfect for those tiny ears. My only complaint is that the correct terminology for the animal children should have been used, such as kitten, puppy, cub. This would help the What a perfect bedtime story for a father to read to his preschooler. Even moms can join in the fun. 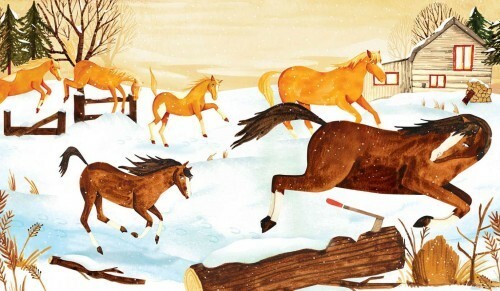 The color illustrations by Marilyn Faucher are whimsical, capturing the joy of each animal dad frolicking with his child out in the wilderness. Add the visual with the rhythmic cadence of Margaret Wise Brown's writing style, perfect for those tiny ears. My only complaint is that the correct terminology for the animal children should have been used, such as kitten, puppy, cub. This would help the parent asks questions such as, "What do you think this daddy bear is doing with his cub?" or "What would a "cat" daddy do with his kittens?" Definitely a lost opportunity to teach the names of animals babies, although adults can easily add in the correct wording when they deem appropriate. However, for a toddler, this is the perfect type of book - short and simple. 12 different creatures with a culminating grand finale of all the fathers putting their offspring to bed for the night. Four stars. Thank you to Netgalley for providing this free ARC in exchange for an honest review. All the Little Fathers is a story about animals that have fathers just like us and how they also do stuff with their kids. From kid's perspective this surely sounds great and the idea is lovely, even if a bit too rosy. It was great of Brown to show what the animal fathers do with their kids - all the things were something they surely do in real life too. So this is quite wonderful for keeping the animals animals and not making them human-like. I just didn't get the point of the little fathers, r All the Little Fathers is a story about animals that have fathers just like us and how they also do stuff with their kids. From kid's perspective this surely sounds great and the idea is lovely, even if a bit too rosy. It was great of Brown to show what the animal fathers do with their kids - all the things were something they surely do in real life too. So this is quite wonderful for keeping the animals animals and not making them human-like. I just didn't get the point of the little fathers, really. The story ends with all the little fathers putting their kids in bed, but where does that little suddenly come from? The fathers are mostly big like giraffes and lions and whatnot. Somehow the story lacked the point, which is kind of sad. All the Little father is a cute, adorable picture book for toddlers, that tell a story of Animal fathers and their sons in the wilderness. Wonderful for every child's first reads. My 2-year-old brother enjoyed the illustration, his favorite is the one with the lion and cubs. I tried to explain to him what is happing, although I'm not the best one that can do the job. The illustration is the most capturing, I loved every picture. They all are simple but delightful, and the colors are warm and vivid. 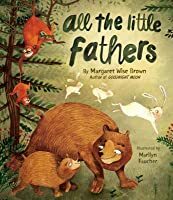 All the Little Fathers by Margaret Wise Brown and Marilyn Faucher is a wonderful picturebook, and just in time for Father's Day. Animals have fathers, just like you. Fathers that play with them, care for them, and love them. All the fathers are looking after their children in this fun and playful story. All the Little Fathers is a very sweet picturebook depicting a variety of animal fathers caring for and playing with their children. 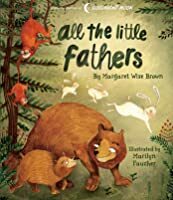 There is a wide variety of ways the father's interact with thei All the Little Fathers by Margaret Wise Brown and Marilyn Faucher is a wonderful picturebook, and just in time for Father's Day. Animals have fathers, just like you. Fathers that play with them, care for them, and love them. All the fathers are looking after their children in this fun and playful story. All the Little Fathers is a very sweet picturebook depicting a variety of animal fathers caring for and playing with their children. There is a wide variety of ways the father's interact with their young, showing that while there are differences the love is there and the most important part of the relationship. With Father's Day right around the corner this little picture book will stir a child's imagination as to the things fathers do for and with them out of love. 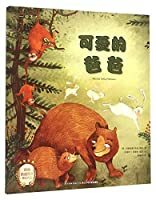 In this book animals are the fathers and it is fun to see and read about their paternal connection with their children within the animal kingdom. What are some of your childhood memories with your father that left you knowing he loved you? Have you seen any animals making this special connection? It does not have to be Father's Day to make With Father's Day right around the corner this little picture book will stir a child's imagination as to the things fathers do for and with them out of love. In this book animals are the fathers and it is fun to see and read about their paternal connection with their children within the animal kingdom. It does not have to be Father's Day to make special memories out of love with your father. So make some special memories! * About the story: There is no story. Each page just shows what different animals do with their children (eg "All the bear fathers were catching fish with their children", "All the dog fathers were giving their children bones to chew" etc.). I suppose it's a good way to introduce children to different animals and to how different animals behave. * About the artwork: Painted in watercolour, the artwork is full of colour and is very vibrant. Something about the art style feels a little naive and no * About the story: There is no story. Each page just shows what different animals do with their children (eg "All the bear fathers were catching fish with their children", "All the dog fathers were giving their children bones to chew" etc.). I suppose it's a good way to introduce children to different animals and to how different animals behave. * About the artwork: Painted in watercolour, the artwork is full of colour and is very vibrant. Something about the art style feels a little naive and not quite as perfectly polished as other art styles, but it's still well done. Each page is quite beautiful with a lot of attention to detail. * Overall: Although I prefer books with more of a story, this is nevertheless a sweet little book that may be particularly enjoyed by animal-loving kids and families. A perfect bedtime story for fathers to read to their kids. 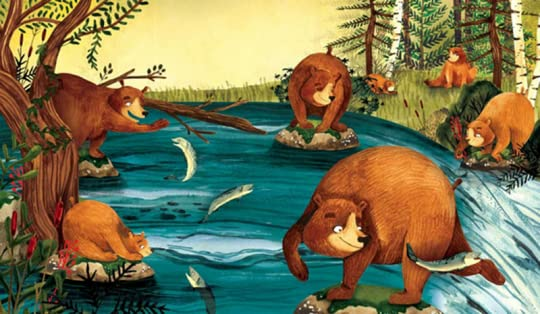 Beautiful illustrations and simple phrasing make this book perfect for toddlers. Each page captures what a different animal father might do for their children; for example giraffe fathers help their kids reach the tall leaves. The illustrations are what really shine and children will love seeing and learning about the different animals. A great activity for dads and kids. All the Little Fathers is a book showing various engaged fathers. Each page is a different animal showing the fathers and their children doing something whether it is roaring, swinging or jumping. I love this idea as it is important for fathers to spend time with their children. At the end, the fathers put them all to bed. Wonderful illustrations accompany the text. A great book for all little ones to share with their dads. I loved it. Thank you Netgalley and Parragon Inc. for the opportunity to All the Little Fathers is a book showing various engaged fathers. Each page is a different animal showing the fathers and their children doing something whether it is roaring, swinging or jumping. I love this idea as it is important for fathers to spend time with their children. At the end, the fathers put them all to bed. Wonderful illustrations accompany the text. A great book for all little ones to share with their dads. I loved it. Such a sweet little bedtime story that will be treasured by fathers and children. Different animal fathers show all the fun they have with their animal kids throughout the day, playing, roaring, jumping, caring for each other and having the best of times. The simple, repetitive text will encourage children to read along. The lovely illustrations accompanying the story add to the overall appeal of the book. All the Little Fathers by Margaret Wise Brown is a perfect gift for any father on Father's Day. Fathers and their children can joyfully read about animal fathers and their children. Minimal words accompanied by bright, beautiful, and colorful pictures illustrate the many activities different father animals participate in with their young. All the Little Fathers is a picture book that can be read at any time but will have the most meaning as a bedtime story. A sweet children's book with beautiful, touching photos of fathers and their children. This would be a wonderful book for bedtime or snuggle time. I want to buy this book to have for my husband to read over and over to our children. There are so many books about mommies and their children but not as many about dads. Perfect Father's Day gift! I received this book in exchange for an honest review through NetGalley. Adorable book about animals and their children. Makes for a cute bedtime story, considering the last page is the children being tucked in. Illustrations are phenomenal! This simple little book about different animal and insect fathers playing and interacting with their children has lovely illustrations. I think it would be a nice Father's Day book for a child to give to their father for them to enjoy together. I received this book free to review from Netgalley. This story was very simple and a great book for father's to read to their children. However, the illustrations were immaculate!! Beautiful picture book! Reviewed through Netgalley for an honest review. Note: I received a digital ARC of this book through NetGalley. To buy for my Gracie girl. Note: I received a free copy from NetGalley. This was a cute book, but the Kindle Edition I received was a mess so I could not fully enjoy it. Margaret Wise Brown wrote hundreds of books and stories during her life, but she is best known for Goodnight Moon and The Runaway Bunny. Even though she died nearly 60 years ago, her books still sell very well. Margaret loved animals. Most of her books have animals as characters in the story. She liked to write books that had a rhythm to them. Sometimes she would put a hard word into the story or p Margaret Wise Brown wrote hundreds of books and stories during her life, but she is best known for Goodnight Moon and The Runaway Bunny. Even though she died nearly 60 years ago, her books still sell very well. Margaret died after surgery for a bursting appendix while in France. She had many friends who still miss her. They say she was a creative genius who made a room come to life with her excitement. Margaret saw herself as something else - a writer of songs and nonsense.